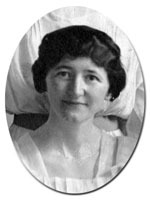 Beulah Blackmore (1886 - 1967) came to Cornell University in 1915 as the first full-time clothing instructor in the Department of Home Economics. Blackmore was exceptionally well educated in her field. She began her training at the Oxford (Ohio) College for women from 1905 to 1906, and a few years later obtained her B.S. at Teachers College, Columbia University. She completed her graduate work at M.I.T. in the summer of 1939. In addition, she attended several other schools, further strengthening her background in fine arts: University of Washington, University of California, Berkeley, New York School of Fine and Applied Art, Grace Cornell Art School, New York School of Fine and Applied Art, Paris branch, and Acad�mie de Coupe de Paris. Blackmore taught three courses during the 1915 school year: "Elements of Design," "Clothing and Handwork," and "Elementary Millinery." She became an assistant professor in 1916 and was named full professor in 1923. In 1925, she became the head of the Textiles and Clothing Department, a position she held until her retirement in September 1951. She helped to develop the Textiles and Clothing Department so that it encompassed a wide array of subject matter, by increasing the curriculum from three courses to over twenty-five. During her years at Cornell, she established a costume shop, introduced courses for men, collected historic and native costumes, fabrics, and accessories, and also opened up research in the psychological aspects of clothing. Blackmore saw clothing and textiles as expressions of culture, and as an art form that people at every economic level could create and enjoy.